Jammu Airport, officially known as Jammu Civil Enclave, (IATA: IXJ, ICAO: VIJU) is a civil airport in Jammu, Jammu and Kashmir, India. It is situated 14 km (8.7 miles) from the international border between India and Pakistan. The asphalt runway, 18/36, has dimensions 2,042 by 45 metres (6,699 ft × 148 ft). It can handle CAT I instrument landing system approaches. The apron has space to park three Airbus A320 aircraft. The Airports Authority of India had published data and statistics of the airport between the time period of April 2013 to March 2014. According to this data, the Jammu airport is ranked the 27th busiest airport in India, with a total passenger traffic of 845,555. This was a decrease of 1.9% from 2012–2013. The airport is located 8 kilometres (5.0 mi) southwest of the city of Jammu, along Ranbir Singh Pura Road. There is a car park with 80 spaces. Bus, taxi and car rental services provide transportation to the city. ^ "Evaluation Of Patna And Jammu Airport" (Press release). Indian Ministry of Civil Aviation. 19 August 2010. Retrieved 27 November 2016. ^ a b "Jammu: General information". Airports Authority of India. 5 September 2016. Retrieved 27 November 2016. ^ a b c "Jammu: Technical information". Airports Authority of India. 25 June 2014. Retrieved 27 November 2016. ^ a b "Jammu: Passenger information". Airports Authority of India. 12 September 2016. Retrieved 27 November 2016. ^ "Jammu -- VIJU". DAFIF. October 2006. Retrieved 27 November 2016. ^ "SpiceJet flight schedules". www.spicejet.com. ^ Lovell-Hoare, Sophie; Lovell-Hoare, Max (2014). 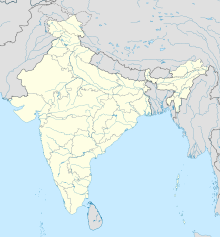 Kashmir: Jammu, Kashmir Valley, Ladakh, Zanskar. Chalfont St Peter: Bradt Travel Guides. p. 230. ISBN 978-1-84162-396-2.